826 18th Street - James and Roxanne Conlin: From the Assessor's websiteIn a few minutes, James Conlin (yes, related to Des Moines attorney Roxanne Conlin) will ask [pdf] the Des Moines City Council to overturn a decision made by the Historic Preservation Commission relating to one of their properties in the Sherman Hill local historic district. 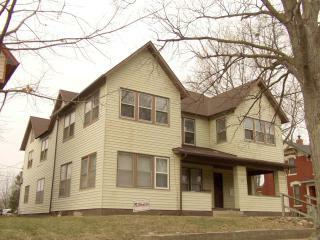 The property is located at 826 18th Street. The local historic district has been in existence since before the Conlins purchased the property in 1989. They want to install vinyl windows in conflict with the Historic Preservation Commission's interpretation of the established local historic district guidelines.